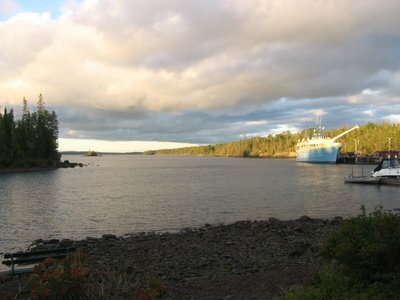 Here is a photo from Isle Royale. 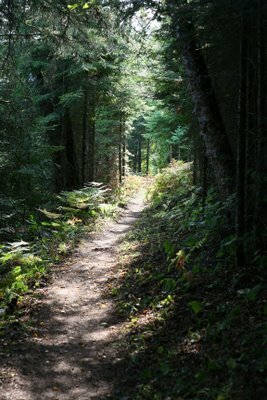 This is where I volunteer with Sierra Club doing trail maintenence each summer. This photo is of Rock Harbor, the place where The ferry boat docks, and where the lodge is, for those who don't backpack ( it's pretty expensive). I have been the cook for the group the last few years, trying to find ways to make oatmeal or soup mix more interesting. We go at the end of August, but the weather can range from hot to cold and wet pretty quickly. Lake Superior is awesome in the true sense of the word. When taking the 5 hour ride over from Houghton, Michigan, I often think of the fact that this huge expanse of water is all that's left of even more awesome glaciers. And here is a photo of a section of trail after we have cut back all the brush. It looks neat and inviting after we are done, but with the hundreds of miles of trail, It is hard to get to each section often enough to keep it looking this good. The Park Service is on very tight budget, so the only have a few rangers that work trails.